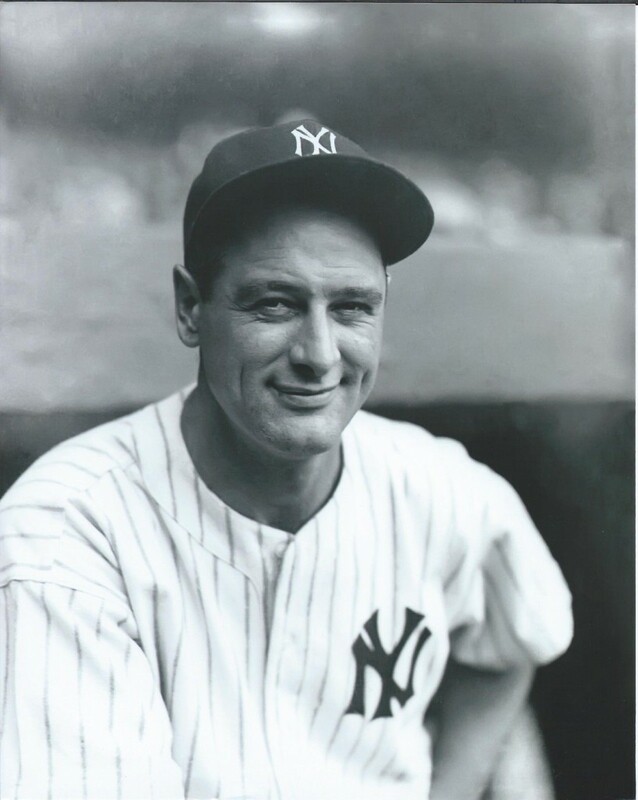 Nicknamed "The Iron Horse," Lou Gehrig played his entire career with the New York Yankees, from 1923-1939. In one of the most profound and memorable moments in baseball, Gehrig publicly retired after being diagnosed with ALS. This debilitating condition affects the body's muscles and central nervous system, and the disease has become known as Lou Gehrig's Disease. A gifted athlete that scouts today would refer to as a "five-tool player," Gehrig set the Major League record for consecutive games played, with 2,130. The record was eventually broken by Cal Ripken Jr. in 1995. The six-time All-Star and seven-time World Series Champion posted lofty numbers, including a .340 lifetime batting average and totaled 1,995 runs batted in (RBI). Lou Gehrig was elected to the Baseball Hall of Fame in 1939. 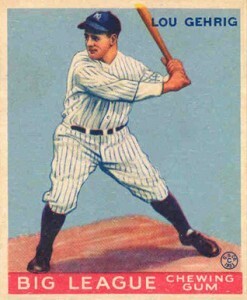 Lou Gehrig has several cards that were printed prior to the release of his officially designated rookie cards, which come from the 1933 Goudey release. The nature of distribution of pre-war cards and the rules pertaining to official rookie card designation can be a bit confusing. 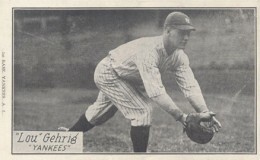 Many cards of Gehrig were printed and available strictly on a regional basis. To be considered a rookie card, the cards must have been available on a national basis. Designated as R319 in the American Card Catalog, the 1933 Goudeys were a revolutionary and groundbreaking set in terms of design and color. Bright, vivid colors are the hallmark of all the Goudey releases. 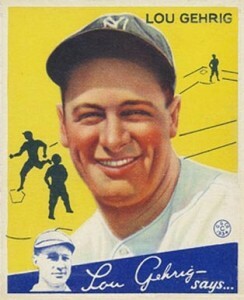 The cards measure 2-3/8 x 2-7/8 inches and the Lou Gehrig card shows him in a batting stance. Even in poor or fair condition, these cards sell in the $700 range. Prices escalate quickly in higher grade, often reaching the high four figures. Despite being nearly identical, card #160 is suspected to have been printed in a smaller quantity than Gehrig's #92 card. These cards can be difficult to find, and even in the worst of condition, carry a premium over card #92. 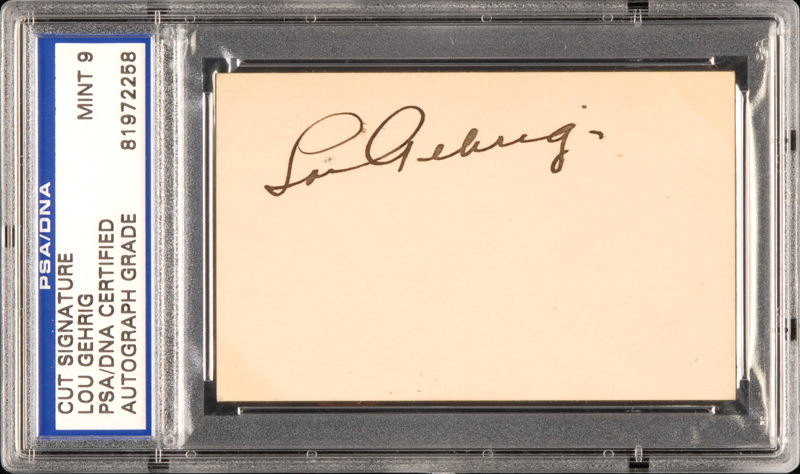 The American Card Catalog lists 56 Lou Gehrig cards printed during his playing career. The first coming in 1925 and the last in 1939. Of those, more than half were printed before the release of his 1933 Goudey cards. Here is a list of some of the more notable ones from his playing days. Measuring 3-3/8 x 5-3/8 inches, this oversized black-and-white card features Gehrig in an awkward stance. 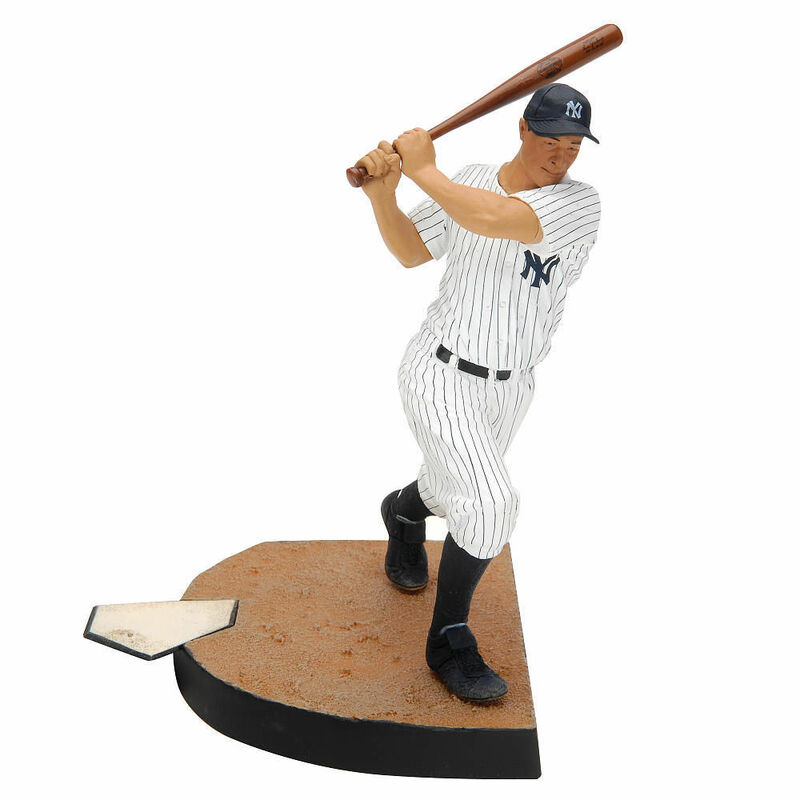 It lists his full name, Heny L Gehrig, along with team (New York Yankees) and league affiliation (American). These cards, as one might imagine by the name, were hand-cut from strips and as such, can be difficult to find in good condition. 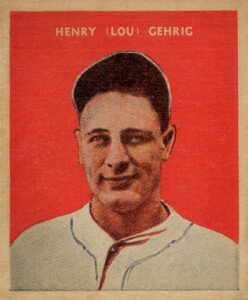 The cards measure approximately 1-3/8 x 2-1/2 inches and feature Gehrig in a black-and-white photograph. 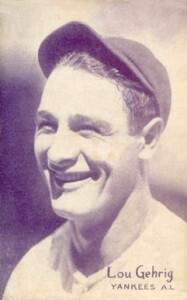 This is one of Gehrig's most popular early cards, showcasing his classic smile in a black-and-white portrait. These cards measure 3-3/8 x 5-3/8 inches. 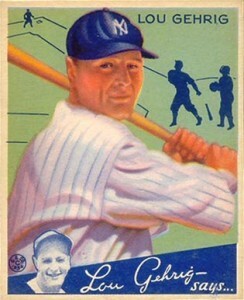 Gehrig has two other cards in the set, card #'s 14 and 15, which both showing him in a batting stance. Laid out in a horizontal format, which is unique for the time period, this card measures 3-1/4 x 5-1/4 inches. 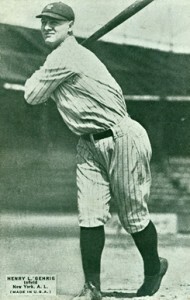 It shows Gehrig in a posed action shot, ready to field a ground-ball at first base. While not a card, this toy novelty is highly collectible. Inserted randomly in boxes of Cracker Jack, this straight pin is just bigger than a nickel and shows an illustration of Gehrig, along with his name, against a yellow background. This card clearly shows how the quality of printing technology began to improve at this point in time. Produced by the U.S. Caramel Company and used as backing for the candy, these cards often exhibit staining. Measuring 2-1/2 x 3 inches, this is a highly-desirable, early Gehrig offering. The DeLong cards are known for their vibrant colors and black-and-white player image. The contrast of the player towering above the stadium, makes them "pop" off of the card and gives them a "larger than life" appearance. Designated in the American Card Catalog as R333, the cards measure 2x3 inches. Building on their success from the previous year, the Goudey World Wide Gum Company released a follow-up set of cards in 1934. Featuring clearer images and vibrant colors, these cards measure 2-3/8 x 2-7/8 inches and are designated in the American Card Catalog as R320. 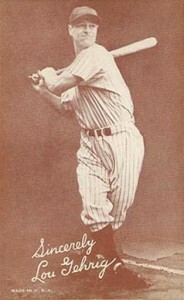 Gehrig's other card in the 1934 Goudey set shows him in a posed batting stance. The facial likeness is better in card #37, which is easily the more popular of the two. 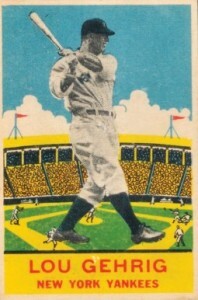 The last card of Gehrig produced during his major league tenure, this oversized card, measuring 3 3/8" x 5 3/8", shows Gehrig in a full body shot as he follows through on a swing. It is accompanied by the salutation "Sincerely" and a facsimile signature. Designated as W462 in the American Card Catalog, this card serves a nice bookend to his early 1925 Exhibit release. When Upper Deck began inserting pieces of game-used memorabilia into baseball card during the mid-90's, it brought new life to the collectibility of long-retired players like Lou Gehrig. No longer were artifacts from The Iron Horse's playing days relegated strictly to the Hall of Fame or deep-pocketed collectors. Now everyone had an opportunity to own a piece of baseball history. A few years later, the company took things a step further and began placing cut autographs of deceased players on cards and the hobby has never been the same. Here is a look at some of Lou Gehrig's premium modern cards. 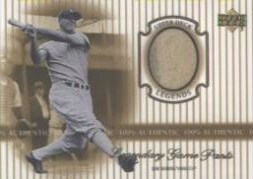 The 2000 Upper Deck Legends set debuted the first game-used memorabilia card of Lou Gehrig. The card contains a swatch of material from a pair of Gehrig's Yankee pinstriped pants. The card is not serial numbered and the actual production numbers have never been released. That same year (2000), Lou Gehrig's first cut signature card was created and inserted randomly into accompanying Mystery Packs as part of the Yankees Master Collection set. Hand numbered to just three copies, it features a small Gehrig autograph cut from a paper document. Not to be outdone by the competition, the following year, the Donruss Company acquired a game-used Lou Gehrig baseball bat. It was subsequently cut up into small pieces, often referred to as chips, and inserted into trading cards. 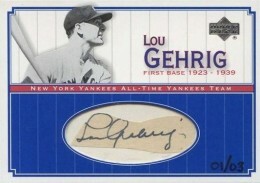 This card was one of the first Lou Gehrig game-used bat cards. By this point in time, Donruss, holder of the Leaf naming rights at the time, had acquired their own Lou Gehrig game-worn jersey. Wanting to create an insert set that truly reflected the name of the brand, the company inserted the buttons and accompanying jersey material, directly onto the card. With six buttons on the jersey, they created a set of six serial numbered cards. In later years, competition in the sports card marketplace would lead to a period of time where the manufactures were consistently trying to up the ante when it came to game used memorabilia cards. Lou Gehrig cards have been featured with large jersey swatches, multiple pieces of bat and uniform, letter patches and more. 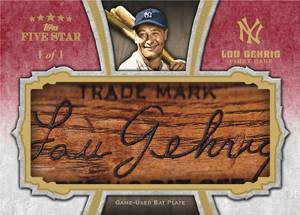 In 2008, Topps created the first Lou Gehrig bat barrel card. This 1-of-1 card used the name plate from a game-used Gehrig bat and was inset directly onto the card. It is in the hands of a private collector, and unfortunately, no photograph is available. Since that time, a few other Lou Gehrig bat barrel cards have been produced. The one pictured here is from 2012 Topps Five-Star Baseball. Unfortunately, Topps would also produce cards containing manufactured (not game-used) bat barrels. Authentic, game-used samples are designated on the back of the cards as such. 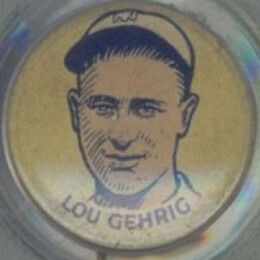 Then, in 2010, Topps produced the first Lou Gehrig bat knob card, as part of the Triple Threads product. Serial numbered 1-of-1, the booklet card also contains a cut autograph. Interesting to note, this card was originally produced with two pieces of jersey material, purportedly worn by Gehrig. However, in looking at the material, collectors immediately cried foul, as the displayed material was clearly used from an era long after Gehrig had played. Topps did the right thing by having the owner of the card return it, then removed the material and inserted a cut signature in its place. The result was that it made for a much nicer card, and created a win-win for all parties involved. 2002 Topps Tribute Milestone Materials Lou Gehrig Game Used Bat #MIMLG PSA 8! LOU GEHRIG 2008 UD PREMIER REMNANTS 4 IRON JERSEY 2 PINSTRIPES 7 20 NYY !!! 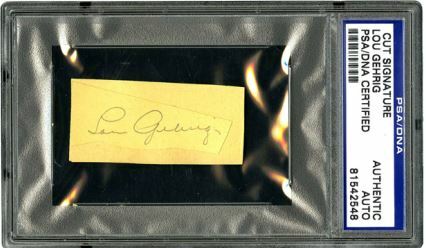 While numerous examples exist of legitimate Lou Gehrig autograph, it is recommended to tread very lightly and avoid buying items online unless they have been authenticated by a reputable company such as PSA/DNA, JSA or are actually part of a licensed trading card product. 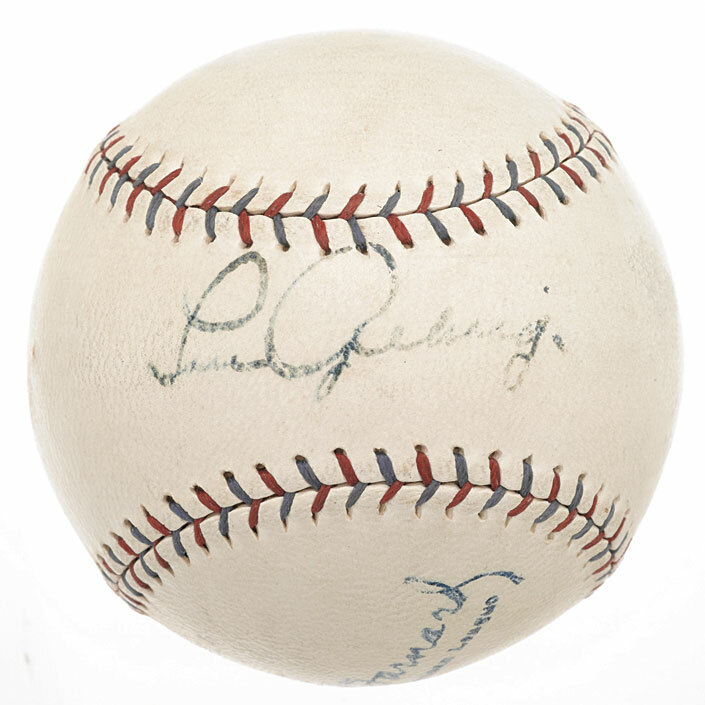 Lou Gehrig's signature is one of the most forged in the sports memorabilia marketplace today. For the sake of comparison and to aid in doing your own research, we provide a look at a few authenticated examples. Being a part of an iconic franchise, winning seven World Series titles and the leagues coveted Triple Crown, not only guarantees you a place in Cooperstown, but insures that one's likeness is used on everything from figures, to photos and more. Printed 1993. Any value ? 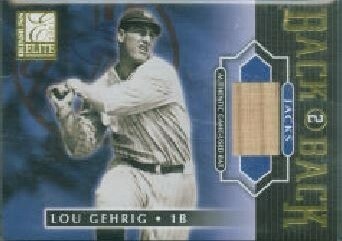 I have vision motion card of Lou Gehrig batting. Dont know what year. Is black and white. Shows batting motions. Have you ever seen one? Made by Kodak Eastman.